_DSC6557, originally uploaded by brianvan. Like an insane person, I decided to bake cupcakes for and attend 2 birthday parties this past Saturday, for Martha/Alice Ayers and for Alice/Betty/Feisty Red. 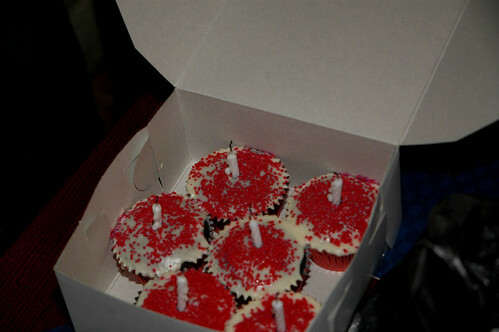 They were chocolate mint cupcakes with vanilla mint glaze and red sprinkles (and of course, birthday candles). I'm just glad I didn't set the cardboard box on fire.